The answer is nothing and everything. It depends. Veneer refers to the surfaces of the tooth being treated. Traditional veneers only cover the front and biting edges of teeth and often times the surfaces between the teeth. The term veneer may not refer to how much of the underlying tooth structure that is removed. For example a veneer can be placed with no preparation to the underlying tooth structure, so that it just bonds onto the existing tooth as it is, or it can be placed after some light polishing and refining of the underlying tooth. At times veneers can be done with heavy drilling on the underlying tooth, where more tooth structure is removed and it is still called a veneer by most dentists because it only covers the front, biting edges and the surfaces between the teeth. Crown refers to a restoration that covers the entire tooth being treated. It is not limited to the font, biting edges and surfaces between the teeth, it also covers the back side of teeth. In most cases a “Crown” will cover the entire toot up to the gum line, so that no underlying tooth surfaces are exposed. Traditional crowns are done with heavy drilling on underlying tooth structure to make room for the thickness of the materials. More modern materials can be made thinner, like veneers, so modern ceramic crowns can be done with light polishing and refining of underlying tooth structure, like a veneer. In cosmetic cases requiring crowns on previously unrestored teeth, most crowns can be completed with light polishing and refining instead of heavy drilling. This patient had an existing older style crown on a front tooth. The goal was to get the two front teeth to match exactly. We tend to see the most symmetry in smile between the two front teeth up to .3mm. The treatment was to replace the old crown and place a veneer on the tooth next to it. 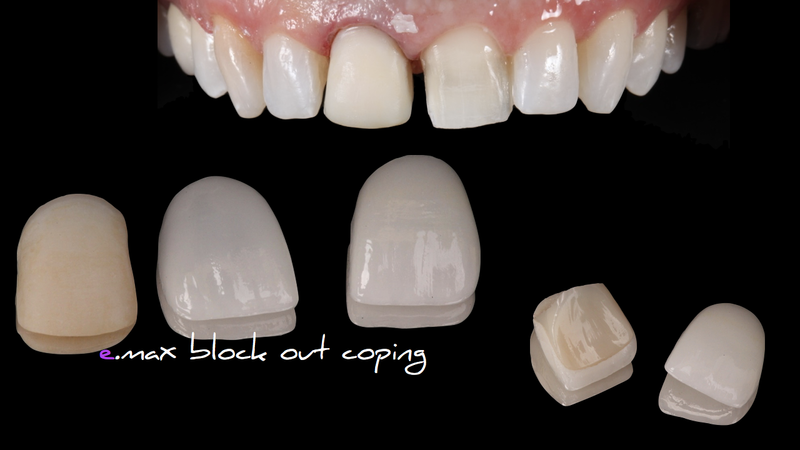 Notice the amount of drilling necessary for the older style crowns vs. a conservative veneer. The dark yellow part of the tooth under the crown is the dentin. The tooth next to it is still all enamel. The result for the crown will be a long lasting and strong restoration. We used the same materials on both teeth to match, with a little trick! The e.max block out coping. It allows us to bring the color of the crowned tooth up to the same color as the veneer tooth, before the thin empress veneers are made and bonded to the teeth. Why the push for conservative restorations? 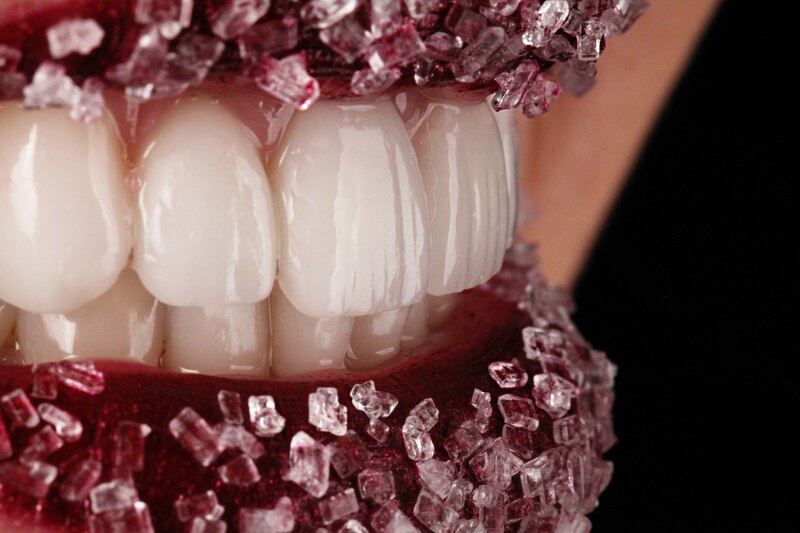 Crowns and veneers can now be made out of the same ceramic materials. 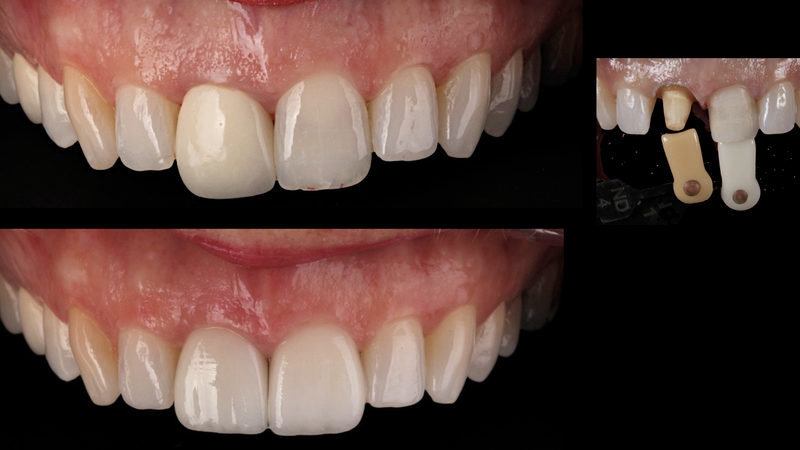 The same type of porcelain we use for veneers we can use for crowns. The benefit is the ability to match crowns and veneers, so that crowns do not look like “Crowns”. We can make both crowns and veneers to be ultraconservative and natural looking. The ability to keep it conservative enables dentists to “bond” the restorations to enamel. The interface between our ceramic material and enamel is the strongest and most reliable bond. Properly bonded veneers and crowns to enamel are impossible to remove without drilling or advanced laser techniques. Studies show they last longer than restorations that are bonded to mostly dentin. Aesthetics can benefit from the conservative restorations by creating more life like restorations that incorporate the coloring of underlying tooth structures because these thinner crowns and veneers can be made more translucent. Bringing the natural warmth of the underlying tooth into the final color of the veneers and crowns creates more life-like final restorations. Crowns and veneers in this patients smile can be made to all look the same color, including their natural looking shapes, textures and styles. It becomes impossible to tell which tooth is a veneer and which one is a crown. Smile Stylists understand that veneer preparations to the existing tooth should be kept as conservative as possible for the benefit of the teeth, patient and aesthetics. Veneers should never require heavy drilling on teeth, because this will negatively influence the outcome of the restoration. Doctors who do not frequently perform these procedures with commonly over drill teeth. Smile Stylist are trained conservative and give options to move teeth into better positions to keep cases as conservative as possible.